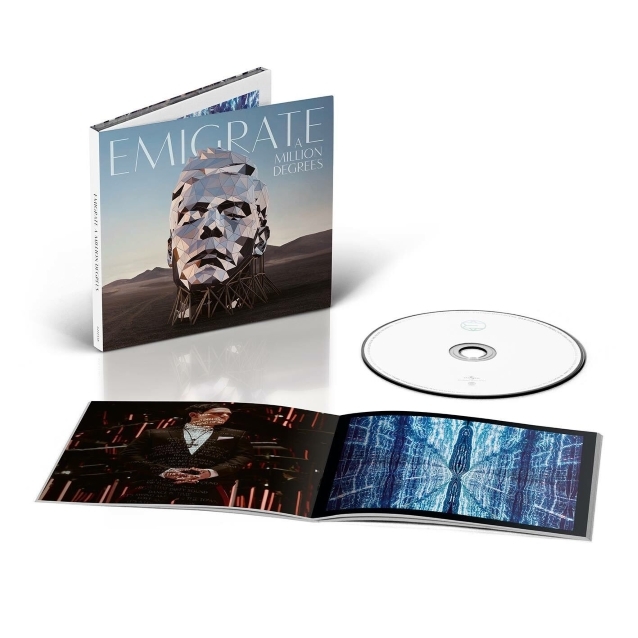 EMIGRATE, the side project of RAMMSTEIN guitarist Richard Z. Kruspe, will release its third album, “A Million Degrees”, on November 30 via Spinefarm Records. Behind-the-scenes footage from the making of the video for the disc’s first single, “1234”, can be seen below. If there’s a description that, personally and professionally, fits Kruspe like a Savile Row suit, “fired up” would be it… As a member of RAMMSTEIN, the music world’s most explosive live act, Kruspe has been part of a ground-breaking global success story that continues to build and to ignite; along the way, he’s turned his attention to a number of parallel projects, such as constructing a new studio (and a new home) in his native Berlin, but it’s his decision to launch the EMIGRATE setup that has given him the greatest chance to satisfy creative instincts outside of the parent group. The first EMIGRATE album appeared in 2007 (a self-titled record that went Top 10 in Germany, with single/video “My World” appearing on the soundtrack to the third “Resident Evil” movie); “Silent So Long” followed in 2014, featuring guest vocals from such high-profile artists as Marilyn Manson, Jonathan Davis, Peaches and the legend that will always be Lemmy. In this respect, EMIGRATE can’t be called either a “side” or a “solo project.” A “passion project” might be closer to the mark — a needed extra outlet operating close to the level of therapy for an artist whose energy, vision and quest for perfection are defining factors, keeping him, well… fired up! “I decided to go to Los Angeles to work with Ben Grosse, the mixing engineer on ‘Silent So Long’,” he recalls, “but for the first time in my professional life I felt that something was missing. I just wasn’t inspired, I couldn’t give the 120 percent I put into every record I’m involved with, so I decided to stop. From September 2017 onwards, a re-invigorated Kruspe set about the task of re-writing, re-arranging and re-recording the album tracks, handling the production side himself, with Van Hoff focussing on the engineering and the mix. They used the historic Funkhaus in Berlin’s Nalepastrasse (onetime broadcasting base of the GDR) for the drum tracks, with everything else being handled in Kruspe‘s own studio; the RAMMSTEIN man took charge of the vocals and the guitars, supported by APOCALYPTICA‘s Mikko Sirén on drums and Arnaud Giraux on bass, both reprising their roles on “Silent…”, with Sky also helping out on bass. “With that song, I initially had trouble deciding exactly what it was about, then all of a sudden it became obvious,” he explains. “It was actually for my daughter. So in the video, which is kind of like a movie, set in the ’70s, in the canyons of L.A., I take the role of the father, and you see how relationships can go wrong and how chances to make things better, even for a second time, can be lost.